Jose De León got overwhelmed by the Hunter Renfroe Express, but Ross Stripling continued to look like a postseason pitcher, even though Stripling was charged with the Dodgers’ 6-5 loss to San Diego. Renfroe had a two-run single and a two-run homer, knocking out De León after 2 1/3 innings — and giving Renfroe 11 RBI in the Padres’ first 11 innings at the plate this series. Only two players the entire season (Paul Goldschmidt and Nolan Arenado) have more RBI against the Dodgers than Renfroe has had in the past 27 hours. Renfroe’s homer was the first ever to land on the top of the Western Metal Supply building at Petco Park. De León (five runs, three earned) wasn’t involved in the decision because Joc Pederson’s two-run, fourth-inning homer — the Dodgers’ third of the night and Pederson’s seventh of September — tied the game at 5-5 in the top of the fourth. 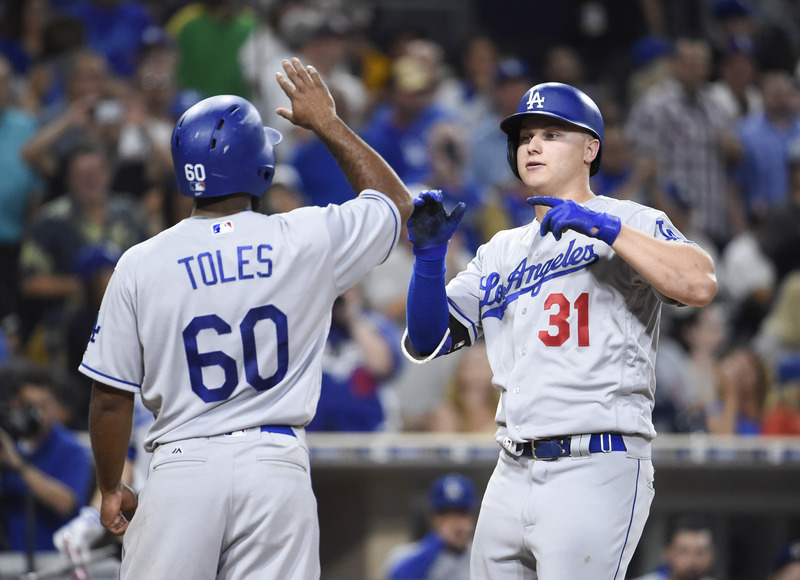 The no-doubt shot gave the Dodgers four 25-homer hitters for the first time since Mike Piazza (40), Eric Karros (31), Todd Zeile (31) and Raul Mondesi (30) in 1997. Pederson’s 25 join the 27 by Yasmani Grandal and Justin Turner and the 26 by Corey Seager. Stripling took the loss despite allowing only two baserunners and striking out four in three innings. With one out in the bottom of the fourth, Manuel Margot doubled, stole third (thanks largely to a missed tag by Howie Kendrick) and scored on an infield grounder when Seager couldn’t get the ball out of his glove cleanly enough to throw home. In 24 1/3 relief innings, Stripling has a 2.22 ERA with 19 strikeouts. Chase Utley had a leadoff homer for the Dodgers, and Adrián González drove in runs with a homer and a double. With four games left in the season, the Dodgers remained two games behind Washington in their bid for home-field advantage in the National League Division Series. I really hope the plan is starting Urias in game 4 (if up 2-1), with Stripling to follow him after 3-4 innings. I can’t see Anderson or DeLeon being an option at this point, and Kazmir is done. So only leaves McCarthy as having a shot. Renfroe’s homer, in this game, will be something I’ll remember for a long time. What a clout. Through 2 games it is Renfroe 11- Dodgers 6. Hopefully the Dodgers figure out how to pitch him because they will be seeing a lot of him over the next several years.